There are plenty of facts about tigers that will amaze you. There is no question that they are very intriguing! The coloring of tigers is to help them have camouflage in the wild. They all have unique stripes and color patterns. You won’t find any two of them that are the same. They also aren’t symmetrical which means the patterns aren’t going to be identical for both sides of the body. The tail of a tiger can be more than 3 feet long. The white tiger isn’t a separate species but rather a color variation. It is due to a recessive gene that can occur naturally in about 1 of every 10,000 births. Most white tigers are bred in captivity. The back legs of a tiger are longer than those in the front. A tiger can leap up to 32 ½ feet! The claws of a tiger can be up to 4 inches long. They are also retractable so they can be drawn in when not necessary. While the teeth of the tiger are very sharp, they only have 30 of them. This is compared to other carnivores who usually have 42 of them. The tongue is very rough and it is designed to help remove fur and feathers before eating meat of the prey they have found. Tigers have two coats – one that is an under fur coat to help keep them warm and insulated. The outer coat helps them to blend into surroundings and to protect them from the elements in their environment. The largest wild population of tigers is located in Sumatra. The range in the wild for tigers has been depleted by 93% since the 21st Century. From 1997 to 2007 the decline in range was 41%. Access to water is important for tigers as it allows them to find food. Their prey relies on water to survive so without it they won’t find enough food in their home range. There are 9 recognized subspecies of the tiger. Tigers are able to adapt to a variety of habitats. They are known to live in the savannahs, grasslands, swamp regions, rocky locations, and even in cold or hot temperatures. They are nocturnal which means they are mainly active at night. They can hunt during the day though so it is a myth you won’t see them out in the day time hours. 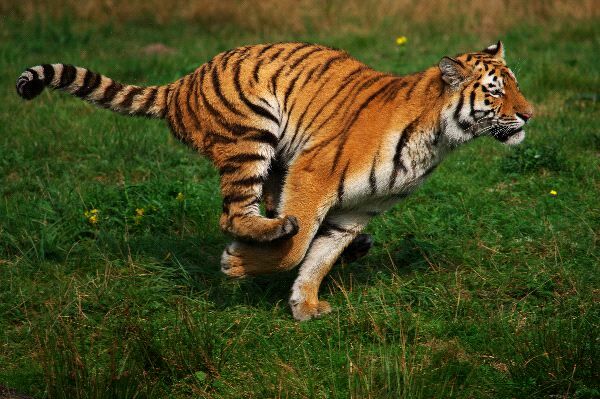 The tiger can run from 35 to 40 miles per hour, but for only a very short amount of time. Up to 88 pounds of meat can be consumed by a tiger at one time. They rely more on sight and hearing to help them find prey than they do on smell. Tigers have the ability to mate any time of the year. Most of the mating activity though occurs from November through April. It takes approximately 14 weeks from the time of conception for the young cubs to be born. There can be up to 6 cubs per litter, each weighing just over 2 pounds. They are blind and helpless at birth. They don’t come out of the den with their mother for about 8 weeks. About half of all young tigers will die before they are 2 years of age. The average lifespan for a tiger that reaches maturity is 8 to 10 years in the wild and 16 to 18 years in captivity. Young tiger cubs will remain with their mother until they are about 18 months old. Males tend to venture on their own sooner than female cubs. Several subspecies of tigers are extinct due to hunting and loss of habitat.